After the requisite recruitment issue comes the requisite training issue. 'Detective Comics' #935 opens with a wild scene, an exhausted team of heroes, and an unimpressed Batwoman. They are not ready. James Tynion IV was the perfect fit for 'Detective Comics.' Despite the necessary world building involving the Red Robin-designed training "mud room," the downtown Gotham base known as "the belfry," and the mysterious assassin lurking somewhere, Tynion elevates these familiar comic book staples by injecting great character moments and dialogue. The concept of a "team book" is more than just fight scenes in a simulator. Tynion understands that chemistry, camaraderie, even conflict matters more than just the next action set-piece. Batwoman isn't happy with the training session and quickly begins to address each of their weaknesses. She's direct and to the point. Tim Drake explains that they're ready and belong on the street helping people. It's these back-and-forth moments that reveal their character openly without narrative tricks, exposition, or inner monologues. Everything is out on the table. Red Robin takes his gripes to Batman with surprising results. No longer the aloof brooding jerk of the past, Batman opens up to Tim reassuring him he belongs in Gotham, that he makes it safer and that is why he wanted him here as the Red Robin. It's as vulnerable as I've seen Batman. He's still protective of his group of young heroes which leads him to check on Jean-Paul Valley aka Azrael. He's hidden away under the care of a very sarcastic Dr. Leslie Thompkins. A groggy Jean-Paul reveals a clue and it's up to the Dark Knight detective, Alfred, and Tim to figure out what it means. Making Batwoman in charge of the training and Batman's equal was a great decision by Tynion. It gives her directives more weight and her character more agency. She's such an underrated hero that this is a good venue for her to train Gotham's vigilantes. Her relationship with her colonel father is an interesting one. Their interaction establishes the playing field between the Kanes and the Waynes. After all, she and Bruce are cousins. He thinks helping Bruce train the vigilantes is beneath her. It's a chilly conversation, to say the least. Tim and Stephanie Brown's scene reveal his reluctance to tell Bruce about a genius grant that would essentially remove him from crime fighting. She calls Tim out on his B.S. and really is a strong positive influence on him. These characters are being fleshed in just the second issue into the "Rebirth" era. Tynion is the guy to do it and it's coming together very well. Even with little action to work with you'd never know it the way artist Eddy Barrows designs a page. No two pages are identical, it's a dynamic blend of panels, panels within panels, and a variety of perspectives. You're constantly looking in new ways and places as you turn the page. Along with Adriano Lucas' bold rich colors, the issue is dense with eye-popping illustrations. 'Detective Comics' is in good hands and relies on developing characters as teammates and people before thrusting them together in mindless action sequences. Tynion understands we want to have a reason to cheer them on and what better way to do that than let us get to know them. There's a great amount of substance and nuance in this title with an underlying mystery. 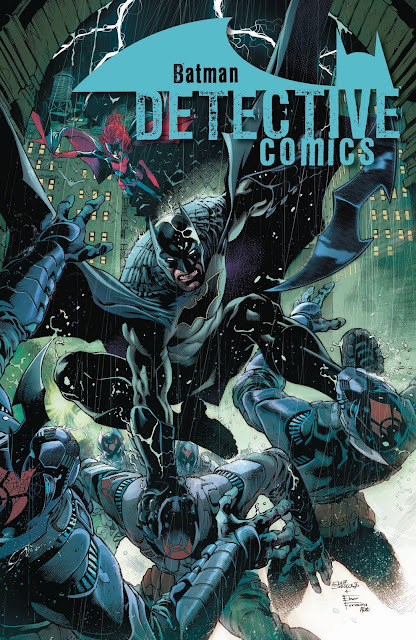 'Detective Comics' is beginning to emerge as one of the best "Rebirth" titles.